Synthesis AG offers Synchronisation Software based on the open standard SyncML DS / OMA DS. SyncML is supported by many mobile devices and groupware applications as an interoperable, vendor independent way to keep data in sync. Use Synthesis SyncML Clients to synchronize your smartphones with SyncML enabled internet services and desktop software. You can buy licenses for Android, PalmOS and Windows Mobile clients online at Kagi.com. Use Synthesis SyncML Technology to connect your solutions with mobile devices and sell Synthesis SyncML Clients along with your solutions. Quickly build SyncML based solutions like wireless data sync and backup using Synthesis SyncML Server - connecting to any SQL/ODBC database or using any other API via custom plugins. 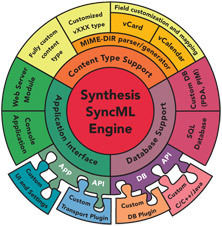 Use the Synthesis SyncML client or server core to integrate SyncML into your existing application or product. Using our SDK, your effort can focus on integration into your environment - Sync specifics are all handled by the Synthesis core. Synthesis AG is a software engineering company located in Zurich, Switzerland, focusing on the principle of sustainability. In every project we work on, we try to improve overall sustainability, by closely examining reasons for resource usage. As we have a sound overview of PC and internet technology from its beginning, we are often able to find elegant solutions, which work with existing, older hardware equipment - especially for small and medium sized projects. We believe that the excessive availability of resources such as memory and CPU power has lead to bloated and therefore unreliable software (and has caused considerable waste of materials, which is a problem for the environment). We think that this needs to be adressed actively; this is what we try to do. We try to follow this motto in all our projects. Not always are the conditions optimally suited for a sustainable solution, but in all projects there is some freedom o choice to aim at a careful solution instead of doing it the quick-and-dirty way. A carefully planned and realised project is always advantageous from both resource and cost points of view.